October - fest | A.B.E. Remodeling, INC.
Well, here we are 'FALL'ing into a new month. It's Autumn once again. Time to notice the change of the leaves & feel the brisk temperatures of the new season upon us. It's also time to think about the many blessings in your life. If you ponder your thoughts, I know you can find things that can be considered "Blessings". Apparently in today's world, or news....there seems to be a """Day"""" for almost anything. I researched the days for October... and oh my gosh, you wouldn't believe some of the "days" to make recognition. I can't put them all on this note....here's a few. Today in fact is "National fire pup day" and also "National homemade cookie day". There are many other """"Days"""" in October such as tomorrow(10-5) being "National fried scallops day". And then on the 4th we have "National Golf day", "National Taco day" and "National Vodka day". You may just want to make sure to accommodate each item and see what happens. J There's something zany for every day.....do research it. It will surely be interesting and amazing. Who comes up with these things???? We should all abide by the recommended October 5- it's "National do something nice day" adding to do something nice for someone. Okay, that's enough…the rest you'll have to find…email us at info@aberemodeling4U.com and I can send you the list. Furthermore, the month of October is accredited to be "National Seafood Month", "National book month" (grab a good book and ""fall"" into it), and October is also breast cancer awareness month. AND PS: don't forget it's also time for church bazaars! And then there is the familiar associated holidays… Columbus Day, All saints day, Halloween. And our own Tim Harris here at A.B.E. Remodeling has a birthday on October 27. 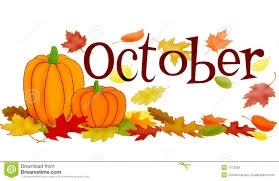 After all this is said…..all I say is that it is one month closer to Christmas… In ending on all this jibberish…we just want to give our October hello to all of you and wish you a pleasant Autumn. May your days be filled with joyful times and good health. Until next time -God bless.